Imagine a pool of oil in the middle of the driveway. An effective way to soak up the oil is to pour sand on top of the oil. Why? The small particle size of sand exhibits a massive surface area that comes into easy contact with the oil, which then attracts and absorbs. How much less effective would it be to use rocks that were a thousand or more times larger than the sand crystals? As you can imagine, pouring a pile of marble sized rocks onto the pool of oil would not be a very effective absorbent as the contact points between the rocks and oil are far less in number, thus exhibiting lesser contact surface area. 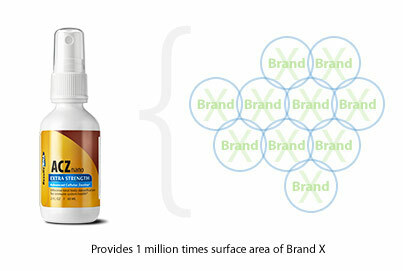 ACZ nano Extra Strength is the only zeolite formula with a range of nano clinoptilolite zeolite crystals. Nano size crystals are dramatically smaller, providing over 1 million times the surface area of competing zeolite products. Comprehensive detoxification equals far greater efficacy for your money.